Cornell’s Rudy Winkler has improved immensely since us dubbing him our Rookie of the Year for the 2014-15 seasons. He continues to throw far – in many instances, further than any other Ivy Leaguer has ever done. He claimed his first conference record this past spring by breaking the conference mark of 242-10 (set by former Princeton throwing Conor McCullough) en route to defending his title in 246-05. That mark was the best mark set by a collegian during the regular NCAA season. Winkler’s NCAA season ended with a runner-up finish at the Outdoor Track & Field Championships as he threw 239-00 to get First-Team All-American honors, bettering his 2015 result (eighth place) and having the best finish for an Ivy Leaguer since Dartmouth’s Dewitt Davies in 1970. But Winkler may still have some work to do. For example, there is still McCullough’s indoor weight throw mark of 76-01, and Winkler is only about 14 inches away from that. Also, there is a NCAA national title. At the rate he’s progressing, it would be a surprise if he doesn’t win it next June. 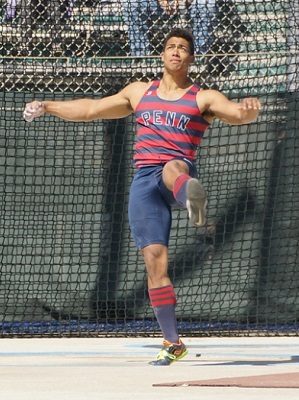 Penn’s Sam Mattis entered his final collegiate season with the goal of defending his NCAA title in the discus. He started off on the right foot, or shall we say, “throw”. In his first meet of the season – on his 22nd birthday, nonetheless – he threw 221-03. That mark is a 16 foot improvement, an Olympic Games qualifying mark, a new conference record, an American collegiate record (aka, the best mark ever done by a collegian who was born in the USA), AND the 4th best throw EVER done in NCAA history. Great way to start the season. He was added to the Bowerman Trophy watch list as a candidate for being the best male athletics athlete of the year. Mattis also became the first man in Heps history to ever four-peat in the event. Each time he won the event at Outdoor Heps, he reset the meet mark – the meet record now stands at 204-11. This, in conjunction with being on the Bowerman Watch list and the American Collegiate Record, led to Mattis being honored as the Mid-Atlantic Field Man of the Year for the outdoor track season. Ultimately, he would end up 1 foot shy of defending his NCAA title, as he finished second to Nebraska’s Nicholas Perry, 201-00 to 200-00. 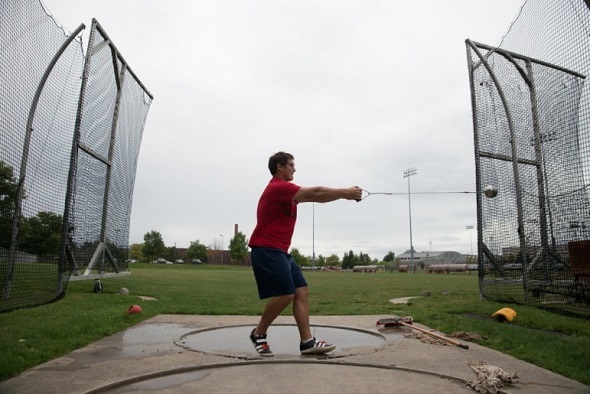 He also came about a foot shy at the Olympic Trials, as he finished in ninth place in the preliminary round – one foot away of earning an additional three throws. He still represented Team USA at the NACAC Championships in El Salvador in July, where he finished in second place with a 188-04 mark. We look forward to seeing both of these men on future Team USA rosters as these men are on the “younger” side of professional throwing. Tokyo, anyone? This entry was posted on Saturday, December 31st, 2016 at 12:00 pm. It is filed under Athletes, Awards, Spotlight. You can follow any responses to this entry through the RSS 2.0 feed.